Canada’s share of North American production of cars and light trucks has fallen to 14.1 per cent in 2014 from more than 17 per cent in 2009. Mexico, with 18.9 per cent of production, has overtaken Canada, formerly a powerhouse in the industry. Canadian light vehicle production climbed slightly last year to 2.382 million units, according to auto analyst Dennis DesRosiers. But falling investment by the automakers in Canada means it is losing its share of production to both the U.S. and Mexico. The big winner is Mexico, which saw its light vehicle production climb to 3.2 million vehicles in 2014. 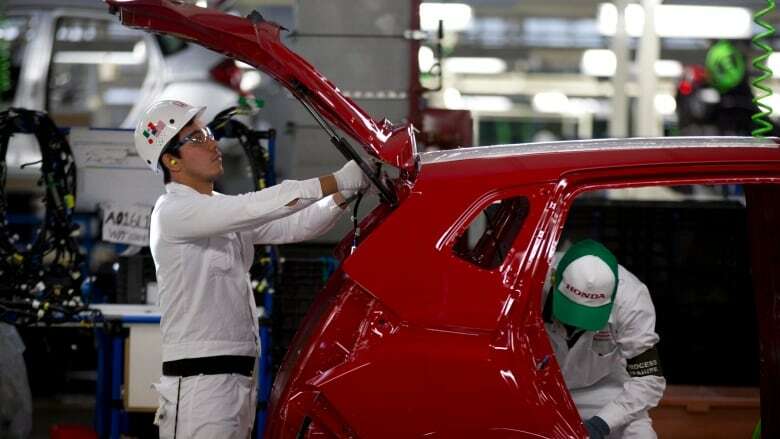 Auto production in Mexico grew 6.8 per cent on the year in January 2015, according to the Mexican Auto Industry Association, with 266,424 cars and light trucks manufactured. Exports hit a record level of 204,907 vehicles, spurred by strong demand from Canada and the U.S., AMIA said. Automakers have made big investments in Mexico, where wages are in the $8 an hour range, compared with close to $40 in Canada. Global automakers poured $7 billion of new investment into Mexico last year, according to the Center for Automotive Research, compared to just $750 million for Canada. Mazda has opened a plant in Salamanca for Mazda3 and Mazda2, and Honda is now making the Fit in Celaya – both invested about $800 million in the plants. Volkswagen, Chrysler, Audi, BMW, GM and Ford all have plans for further investment in Mexico, which has already overtaken Canada as a production centre. "Mexico is an attractive place for production and has been since NAFTA began," says Kristin Dzicek, an analyst with Center for Automotive Research in Michigan. Mexico is close to markets in the U.S. Southwest and has easy shipping from its ports without the bother of snow. And it has 44 free trade agreements which open doors to its products in other countries, Dzicek said in an interview with CBC's The Exchange with Amanda Lang. The outlook for Canadian auto production is “clouded,” DesRosiers said, despite a falling dollar which will make production cheaper. Among the uncertainties is whether GM will commit to further production in its Oshawa plant after 2016, and whether any of the big three automakers will expand production. And uncertainty over costs makes the outlook for Canada dim, says Dzicek. "Canada is now more competitive [than the U.S.] on a cost basis for labour, but that’s because of the change in the loonie. That could change in a few years," she said. Dzicek said automotive jobs tend to be high-value jobs that can really power a local economy and she recommended governments play the incentive game to keep automakers in place.